First birthdays are a huge deal. Though it has been repeatedly pointed out to me that the baby won't remember his first birthday, I hardly see that as the point. The first year of a baby's life is incredible. They grow, change and learn so quickly. The pace is slightly heartbreaking. You barely have time to hold the baby before they are sitting up......crawling......walking. Time moves fast and your perfectly swaddled bundle is soon sitting in a high-chair covered in frosting. All the sleepless nights, all the feedings, all the diaper changes, the teething and the rest of it - you've survived - so has baby. This is cause to celebrate. "Abbie, just make a cake from a box, call our parents to come over, we'll sing Happy Birthday and just be done with it." Husband, you've obviously never pushed a living being through your body. If you had, you would realize that what you just said is quite possibly the stupidest thing you've ever spoken. Call me a birthday snob, but I believe that birthing an infant deserves more than a nod from Duncan Hines. Well, Sunday was Jack's first birthday party and boy, did I think I had pulled off something great. I had everything perfectly planned and it really turned out well. I was quite pleased with myself. It was a perfect first birthday party. I had done a good job. 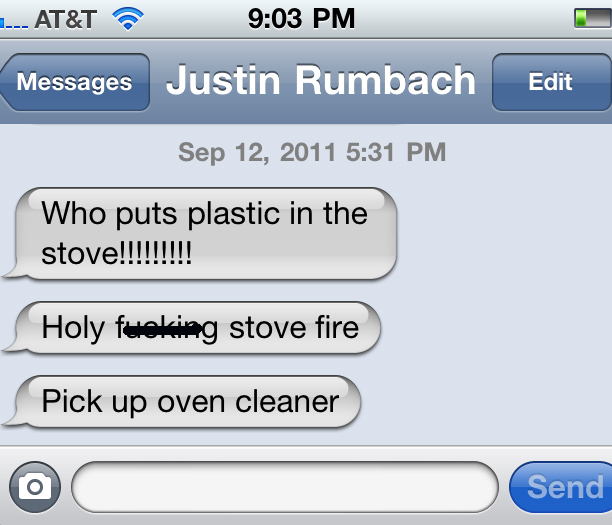 To clarify, he meant oven - not stove. 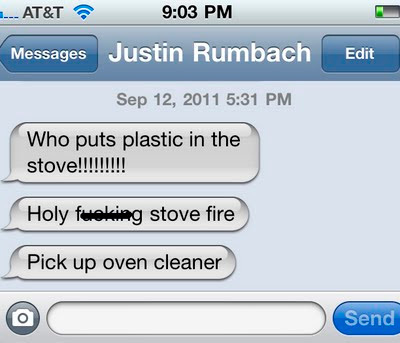 He meant to say "Holy f*cking Oven Fire." I suppose I'll cut him some slack seeing as that he was texting me while our house was filling with smoke and our children were suffocating. In a mad dash to tidy up before the party, I had placed a tupperware container full of cookies in the oven. I guess I forgot to take them out because as Justin was pre-heating the oven for a gourmet feast of Tyson chicken nuggets he was met by the smell of burnt plastic accompanied by some pretty impressive flames. Damn. Now what? How do I clean melted plastic out of the oven? I'm afraid the oven might be ruined. Now please don't worry. We won't starve without our oven. I'm not sure I even need an oven. What do I make in there anyways? Nuggets? Fish Sticks? I'm pretty sure I can make those in the microwave. Well, Happy First Birthday Jack! Subsequent birthdays will be celebrated with Duncan Hines cake batter.